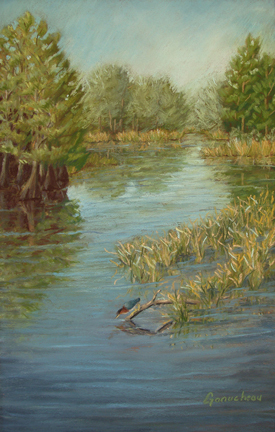 Pastel pleine-aire painting of the lake behind the New Hanover County Senior Center on College Rd. in Wilmington, NC by Rose Ganucheau. Painted in early fall, I stood among the cool shaded trees at the edge of the lake. I marveled at the reflections in the water, and promised I would come back when the trees turned burnt orange. Honorable mention at the first Coastal Pastel Society of North Carolina Show.